Happy New Year to you and yours from Generations United! As we welcome 2010, we’re taking a look back at 2009. Here are some major moments in 2009 for GU. How was 2009 for you? Did you celebrate any major milestones? Challenges? Adventures? Share them in the comments below! We began the year with exciting news – a multigenerational family at America’s most famous address! Marian Robinson, mother of First Lady Michelle Obama, moved into 1600 Pennyslvania Avenue this month. Mrs. Robinson plays a vital role in raising the family’s two young daughters and is a wonderful role model for grandparents everywhere. As the 111th session of Congress convened in Washington, we were finalizing GU’s public policy agenda. Our top priorities: giving priority to communities building facilities that serve both young and old; ensuring that grandfamilies benefit from the Fostering Connections to Success and Increasing Adoptions Act, which became law in 2008; and promoting intergenerational civic engagement and multigenerational activities. It was a tough month for the economy, as the Dow fell to its lowest point in a decade. The increased unemployment meant that families were increasingly reliant on each other for help. GU was a resource for an April 4 article by the Wall Street Journal about the unique stress on grandfamilies in the weakening economy. Former Kansas Governor Kathleen Sebelius was confirmed this month as the President’s Secretary of Health and Human Services. States waiting to fully implement the Fostering Connections Act – created to assist children being raised by grandparents and other relatives – could move forward in the journey from policy to reality. May – Who Supports Early Childhood Education? Active, engaged older adults who see the value of giving all children the benefit of a quality start! May was Older Americans Month, the perfect month for GU to spotlight our initiative Seniors4Kids – a civic engagement program that began in 2005, calling attention to the sometimes-overlooked fact that some of the most passionate advocates for pre-kindergarten education are 50+. June – Up, Up And Away! June saw the nation carried away by Up, the Pixar animated film about a 78-year-old man who ties balloons to his house and flies away – with an 8-year-old stowaway on board. This hit movie was critically acclaimed and highlighted how the young and the old can learn so much from one another. 2009 was a great year for stories in other media, as well, with GU’s resources, expertise and commentary featured in dozens of national and local newspapers, magazines and broadcast outlets, including the New York Times, the Wall Street Journal, the Baltimore Sun, Ladies’ Home Journal and Philanthropy News Digest. GU’s 15th International Conference brought together experts, educators, advocates and speakers who enlightened us all on the “Why,” the “What” and the “How” of intergenerational work. The conference kicked off with a fabulous intergenerational drum circle. Mark your calendar – our next conference will be July 25-29, 2011 in Washington DC. In July, GU also launched a Best Practices Designation for Intergenerational Programs. Senator Edward M. Kennedy’s passing meant the loss of one of America’s most passionate and effective advocates for children, seniors and families. Edward M. Kennedy might have lost his yearlong fight with brain cancer, but he will leave over five decades of victories for the most vulnerable members of our society. All generations, past, present, and future will benefit from his legislative legacy and owe him a debt of gratitude. Thank you, Senator Kennedy. In the spirit of Senator Kennedy’s strong support for service and the Serve America Act passed in April that honors his legacy, September 11 provided an opportunity for people of all generations to take part in the first National Day of Service and Remembrance. September also marked celebrations for National Grandparents Day and the 50th anniversary of the Section 202 Supportive Housing for the Elderly Program. Thanks to LEGACY Intergenerational Housing provisions that GU’s members helped make possible, some 202 funds are now being used to develop housing for grandfamilies. We strengthened our online presence this year by launching a Facebook page and joined the Tweetosphere later in the year with a Twitter feed. If you’re not our fan on Facebook (or follower on Twitter), start now – it’s a quick way to update you on all we’ve been doing (and find out what you’re up to as well). Donna’s blog saw more posts and more readers as well. GU gave thanks this month for all of our diverse and valued members, who come together because they realize the value of a supportive, mutually beneficial agenda. We celebrated the amazing work happening at our 2009 MetLife/GU Intergenerational Shared Site Excellence awards winners, and solicited entries for the 2010 awards. Most of all, we were grateful for the children, youth, families and seniors who show us every day the benefits of viewing life through an intergenerational lens. On Christmas Eve, the United States Senate followed the House’s lead and passed its version of health care reform – extending care to millions of uninsured children, families, and older adults. And on the other end of Pennsylvania Avenue, GU’s year came full circle. Grandparents were once again highlighted in the White House, this time on the Christmas tree! Donna had the opportunity to attend a holiday reception hosted by the President and First Lady and was delighted to see the tree decorated with ornaments created by people around the country – including GU grandfamilies partners from Arizona and Maryland. Carol Scott here, the new Communications Coordinator at Generations United. I'm thrilled to be a part of the great work going on at GU and am excited about this chance to virtually interact with members, advocates and friends of GU! Please don't hesitate to contact me with story ideas, feedback or communications ideas. As we dug ourselves out of the snow that blanketed the DC area this weekend, we unearthed great news: GU was featured on the New York Times Web site on Monday! The NYT's “New Old Age” blog featured a warm, witty story about a California grandfamily, including context and background from GU’s executive director Donna Butts on the benefit of intergenerational community. They watch Dodgers games together and go shopping for clothes, and Marjorie Marsh welcomes Laura Marsh’s friends for birthday parties and other festivities. Such arrangements can help grandparents age in place, give young adults a sense of responsibility and allow elders to pass along family traditions. “We think it has a lot of value,” Ms. Butts said. 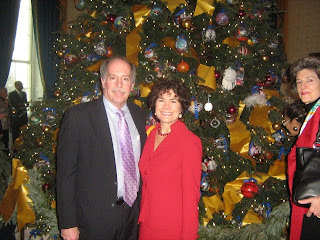 Monday I had the honor of attending a holiday reception hosted by the President and Mrs. Obama at the White House. It was beautiful. One tree in particular caught my attention. It was huge decorated with yellow ribbons and ornaments created by people around the country...including some of our very own grandfamilies partners from Arizona and Maryland! I'm sharing a picture of the tree and a link to a story and pictures of the ornaments that came from Arizona. Also joining me in the picture is GU board member Bob Blancato. 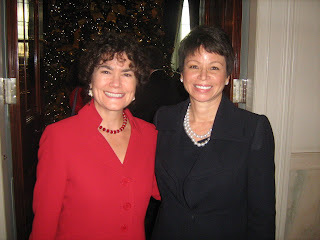 I've also included a photo of me with Valerie Jarrett, who heads up public engagement for the President, in front of the tree. I told her we were so delighted that grandparents could be represented on the tree. And I couldn't resist sharing the photo below. 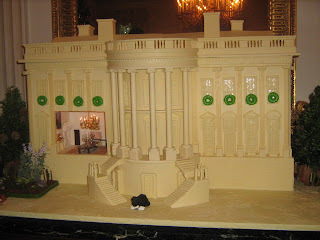 It's a wonderful white chocolate model of the White House including a dark chocolate Bo the dog sitting in front near Mrs. Obama's garden.